Valve's new utility helps you determine if your PC meets the minimum requirements to run virtual reality games. The SteamVR-powered HTC Vive virtual reality headset is officially up for preorder on February 29 , and Valve wants to help make sure your PC is ready for it. 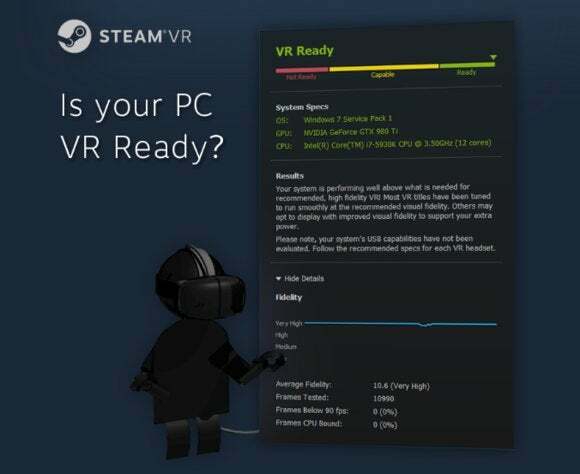 Valve recently published a free program on Steam called the SteamVR Performance Test that will automatically check your system specs to see if they make the grade for Steam’s virtual reality platform. Oculus VR published a similar tool for the Rift in January. Valve’s tool analyzes your PC by having it run a two-minute sequence from Valve’s Aperture Robot Repair VR demo. The test is specifically looking at your system’s ability to hit 90 frames per second and its visual fidelity for VR. Once the VR check is finished, the program gives you a simple color-coded report detailing what will and won’t work with SteamVR. If your graphics card is up to snuff but your processor isn’t, for example, the program will let you know that. Like most Steam-related downloads, Performance Test is only available through the Steam store. Funnily enough, however, you may not even need to download the program as the recommended specs for Performance Test appear to detail what you need to run SteamVR. Those minimum specs include an Nvidia GeForce GTX 970 or an AMD R9 290 (or greater) for the graphics card. On the processor side, you’ll need at least a quad-core 3.3GHz Intel Haswell Core i5-4590 or the 4GHz AMD FX-8350 based on the Piledriver architecture. You’ll also need 4GB of RAM and Windows 7 SP1 or newer. 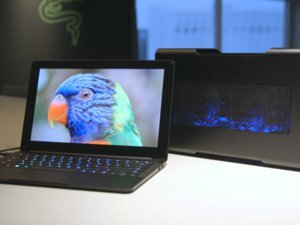 The impact on you: Whether you can get away with lower specs than those above is unclear, and we didn’t get a chance to test the new software. Even if you could get away with lower specs, you probably wouldn’t want to. A lower-grade system probably can’t maintain the higher frame rate that virtual reality requires—the aforementioned 90 frames per second. With performance any lower than that, motion sickness is almost inevitable due to intermittent lag (choppy video). If your PC does meet the recommended specs, you should probably run Performance Test anyway just to be sure everything is up to snuff—especially if you plan on preordering a Vive on Sunday.